Dr J W L Fielding, Department of Surgery, University of Birmingham, Queen Elizabeth Hospital, Edgbaston, Birmingham B15 2TH, UK. Background: A large proportion of patients attending open access endoscopy have histological and gross pathological findings that are potentially premalignant. The proportion of these patients who go on to develop malignancies and the timescale over which this occurs are uncertain. Aims: This study aims to discover the incidence of gastric cancers in this “high risk” group and to examine the potential for their early diagnosis and treatment. Patients: A total of 1753 patients attended open access endoscopy. From these, 166 patients with dysplasia, intestinal metaplasia, atrophic gastritis, foveolar hyperplasia, regenerative changes, polyps, or ulcers who agreed to undergo annual surveillance endoscopy were studied. Methods: Patients were endoscoped annually. Additionally, patients with ulcers were re-examined at two monthly intervals until ulcer healing. Cancers detected were treated by gastrectomy. Results: Twenty two of 1753 patients attending open access endoscopy had gastric cancer (1.3%). In the study population, 14 cancers were detected over 10 years (8.4 %). These were of an earlier stage than those detected at open access (stage I and II 67% v 23%; p<0.05) and five year survival was significantly higher (50% v 10%; p=0.006). In atrophic gastritis and intestinal metaplasia the risk of malignancy was 11%. Conclusions: In patients with atrophic gastritis or intestinal metaplasia, annual surveillance can detect most new tumours at an early stage with a major improvement in survival. Potential benefits of such a surveillance programme are large and warrant further investigation in a multicentre randomised controlled trial. Gastric cancer remains the world's second, and the UK's fifth, largest cause of cancer related deaths.1, 2 Gastric cancer traditionally carries a poor prognosis with 79% of tumours diagnosed at stage IV and five year survival less than 5%.3 Strategies to combat gastric cancer encompassing both earlier diagnosis and improved surgical management have led to significant improvements in prognosis, and gastric cancer, if diagnosed at an early stage, is now a curable disease. In the UK, although survival rates for early cancers can approach those achieved in Japan,8 the incidence of gastric cancer is too low to warrant screening the asymptomatic population and more targeted procedures are required to detect gastric tumours at an early and treatable stage. The earliest symptoms of gastric cancer may be mild dyspepsia, clinically indistinguishable from benign causes, and although the proportion of adults suffering dyspepsia is high, rapid assessment and investigation of symptomatic patients can increase the proportion of early tumours to 26%.9 To further improve on this value, subgroups of patients at increased risk of malignancy need to be identified. Carcinomas of the stomach are thought to arise from a series of changes within the gastric mucosa progressing through atrophic gastritis, intestinal metaplasia, and dysplasia to malignancy.10 Many patients attending endoscopy have gastric ulcers, polyps, or histological changes of atrophic gastritis, intestinal metaplasia, or dysplasia, all pathologies that are potentially premalignant. Surveillance endoscopy in this group of patients potentially has the ability to detect lesions that develop at an early stage and improve survival. Although the optimal management of all of these patients is uncertain, reports on the progression of dysplasia to malignancy are well described and there is little doubt that these lesions should be closely scrutinised and followed up.11, 12 The progression of atrophic gastritis to intestinal metaplasia over years of endoscopic follow up has been demonstrated13 and intestinal metaplasia is frequently associated with gastric malignancy.14, 15 Although it has been reported that surveillance of type III metaplasia has increased the proportion of early tumours detected,16 the efficacy of surveillance in other types of intestinal metaplasia and other forms of mucosal changes, ulcers, and polyps has not previously been demonstrated by clinical trials. This paper reports on 10 years of surveillance of such premalignant lesions. Data are available for patients seen and followed up at the Queen Elizabeth Hospital. Of the initial 1753 patients who had endoscopies performed at the Queen Elizabeth Hospital between 1984 and 1988, 22 had gastric cancers (1.3%) and 368 (21%) patients had lesions requiring follow up. These 368 patients were the initial group of interest for this study and all were offered surveillance endoscopy in keeping with the original protocol: 202 patients declined and 166 accepted. This study reports on the follow up of the latter group of 166. Table 1 shows the distribution of patients in the entire group and the subgroup that accepted follow up. For analysis, patients with more than one high risk histological change were included in the group containing the more severe change. The group that declined repeat endoscopy were discharged in keeping with the routine practice at the time and no follow up data are available from this group. Data were analysed using the SPSS 9.0 for Windows statistical package (Chicago, Illinois, USA). Over 10 years, 14 new cancers were diagnosed in the follow up group, representing 8.4% of the patients accepting follow up. The stages of the cancers diagnosed in this group were significantly lower than those diagnosed at open access (p=0.041) (table 2) and within the group only one tumour was not amenable to surgery with curative intent. This diagnosis of earlier stage disease has resulted in impressively improved survival, with 50% of patients surviving five years compared with 10% in those with tumours diagnosed at open access. Kaplan-Meyer survival curves are shown in fig 1 and the difference in survival is highly significant (log rank 7.45, df=1, p=0.0063). 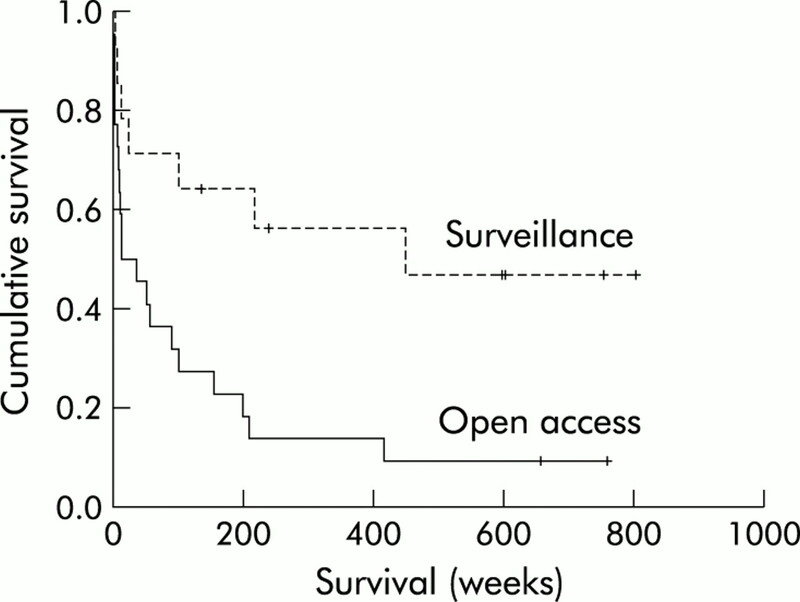 Survival curves for the surveillance and open access groups (p=0.0063, log rank). In the surveillance group, four patients who had gastric ulcers had gastric cancer diagnosed at endoscopy, repeated at two monthly intervals until ulcer healing. These are without doubt malignancies missed at the original endoscopy. It might be thought that if these cases were excluded from analysis the results for the 10 true surveillance detected cancers would be poorer. In fact this is not the case and the five year survival in the subgroup excluding these four missed cancers is 60% (6/10). Both stage of disease and survival within the group accepting surveillance appears to have been influenced by adherence to the original protocol. Unsurprisingly, a prolonged interval between the most recent benign endoscopy and the endoscopy diagnostic of malignancy was the greatest factor in the diagnosis of later stage disease and poor survival (fig 2). Four patients had intervals longer than two years. Of these one patient had inoperable disease, two had stage III, and only one stage II disease. Of the three patients with stage III and IVb disease, two have died from recurrent or inoperable initial disease and the other has subsequently developed metastatic recurrent disease. In the 10 patients where the protocol was observed, one patient with an ulcer that had failed to heal had stage III disease. The remaining patients had either stage I, II, or early gastric cancer stage III disease. Although five of these 10 patients have subsequently died, one postoperatively, in no case was the cause of death attributable to gastric cancer. Time from initial endoscopy to development of gastric cancer and stage of tumour at diagnosis. Numbers within the bars are times from penultimate endoscopy to diagnosis. EGC, early gastric cancer; Ulcer, ulcers failing to heal. Examining the pathological finding that predisposed to gastric malignancy, six cancers developed in patients who initially had gastric ulcers. Four of these were undergoing a second endoscopy examining ulcer healing and these, as discussed previously, represent missed initial cancers. In two cases cancers were detected after ulcer healing had been confirmed on endoscopy, one 12 months later and one 38 months later. These are true surveillance detected malignancies and in both cases intestinal metaplasia was also present. Only one of 16 patients with a polyp developed cancer. This patient was one of the two with an initial ulcer and intestinal metaplasia. Table 3 demonstrates the cancers that developed in the high risk histological lesions. Excluding the ulcers that failed to heal, intestinal metaplasia and atrophic gastritis appeared to be the histologies at increased risk of developing malignancies, with 11% and 18%, respectively, progressing to cancers. This study has demonstrated that surveillance of chronic atrophic gastritis and intestinal metaplasia is worthwhile. Although it has been suggested that it is mainly the incomplete type III intestinal metaplasia that progresses to malignancy,14, 15 the cancers discovered in the surveillance group were not confined to those patients with type III metaplasia. On the basis of this study there is little to be gained from the surveillance of foveolar hyperplasia or regenerative changes. In the absence of atrophic gastritis or intestinal metaplasia, healed gastric ulcers do not appear to represent an increased risk of cancer. Although no cancers developed in polyps without intestinal metaplasia, the numbers involved are small and no conclusions can be drawn. None of the seven patients with dysplasia developed cancer. Although progression of severe dysplasia and to a lesser extent moderate dysplasia to carcinoma is well described, low grade dysplasias do not appear to have the same malignant potential.12, 18 There is a broad overlap between low grade dysplasia and regenerative changes and in more recent years stricter criteria for the diagnosis of low grade dysplasia have resulted in fewer of such cases being reported. Six of the seven dysplasias in the surveillance group were low grade. Cancers missed at initial endoscopy are a universal problem. It is well known that inadequate biopsies may misdiagnose a malignant gastric ulcer as benign and for this reason the old dictum that gastric ulcers should be endoscoped until healed holds true. Early gastric cancers present more of a problem. They may not appear obviously malignant, they are easily missed, and more difficult to biopsy. The consequences of missing these early curable tumours is also more serious as they may only present when symptoms have progressed despite powerful acid suppressing treatments. In all likelihood they will then be at a late incurable stage. Early gastric cancers may take many years to progress and many will exist on a background of atrophic gastritis, intestinal metaplasia, or dysplasia. In this study, two patients had cancers diagnosed on the first annual surveillance endoscopy and a further patient was diagnosed 12 months after endoscopy had confirmed ulcer healing. It is impossible to determine if these were initially missed early gastric cancers or an early malignant ulcer “healed” by acid suppression. That seven of the 10 surveillance detected cancers were picked up within five years adds some weight to this idea but even if this were the case it is not clinically important. Under current protocols these patients would have been discharged but surveillance has been successful in detecting cancers before they progressed to a late stage. The aims of early diagnosis and improved survival have been borne out by this study. In the surveillance group the proportion of operable tumours increased to 93% (13/14). In the 10 cases where the surveillance protocol was strictly observed, all cases were operable. In this subgroup, apart from the single postoperative death (stage III, follow up for gastric ulcer), all patients had stage I, II, or early gastric cancer stage III, and none has suffered recurrent disease. Acceptance of annual endoscopy has been a major problem in this study. The overall acceptance is only in the order of 50% but now that the importance of these lesions can be fully appreciated it may be that patients will be more amenable to and compliant with surveillance. For a screening programme to be effective it must be acceptable, sensitive, and specific, and detect tumours at an early stage when outcome can be improved. Surveillance of a defined high risk group appears to meet these criteria. The cost implications of a screening programme are significant. Year on year approximately 21% of new patients attending for endoscopy will have lesions that by the protocols of this study would require annual surveillance endoscopies. Follow up of these patients will be a major undertaking. Limiting surveillance to the group with atrophic gastritis and intestinal metaplasia will reduce the number of patients requiring screening by approximately a third. In this group the risk of gastric cancer is in the order of 10% over 10 years. Assuming annual endoscopy, the pick up rate for gastric cancer in the group would be approximately 1 per 100 endoscopies or if surveillance were performed every 18 months, 1 per 66 endoscopies. This compares favourably with open access (1 per 77), especially if the early stage of disease at diagnosis and superior survival are taken into account. Assuming the proportion of stage I and II disease remains similar to that reported in this study (0.64), the number of endoscopies required to detect one stage I or II cancer would be 103 compared with 257 at open access. This study does not offer sufficient evidence on its own to call for a nationwide surveillance programme. The numbers involved are small and important questions regarding the optimum time interval between screening endoscopies, the outcome of patients not followed up, the potential for reducing overall gastric cancer deaths in the population, or the effect of increasing patient awareness to changing gastrointestinal symptoms may have in diagnosing cancer at an early stage have not been addressed. The study does however indicate that the potential benefits of such a screening programme are large and warrant further investigation in a large scale multicentre randomised controlled trial of surveillance of intestinal metaplasia and atrophic gastritis. Cancer Research Campaign. Factsheet 1. Incidence—UK. Cancer Research Campaign, 1998. Cancer Research Campaign. Factsheet 24. Stomach cancer. Cancer Research Campaign, 1995. Allum WH, Powell DJ, McConkey CC, et al. 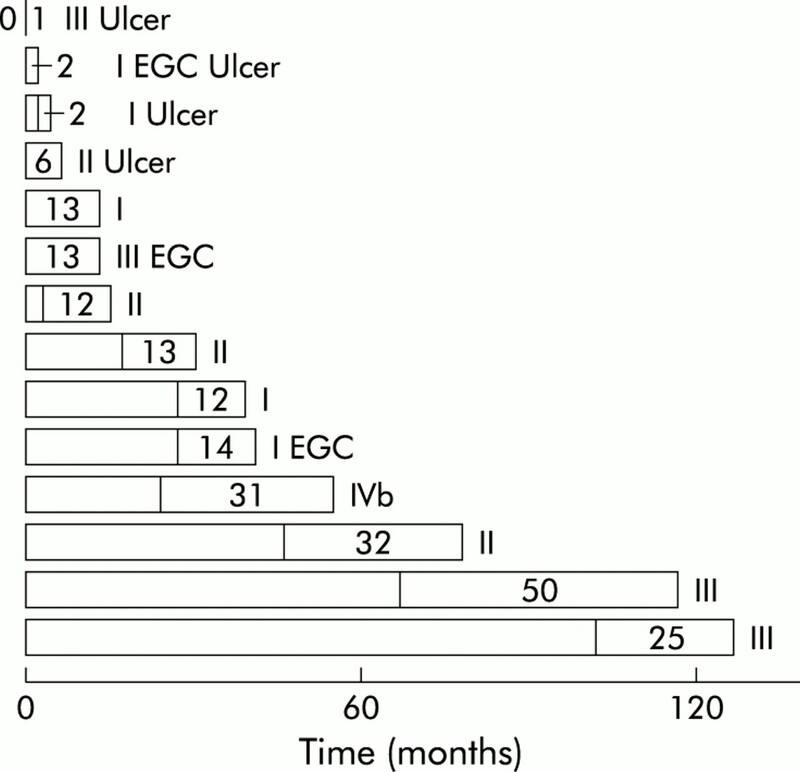 Gastric cancer: a 25-year review. Br J Surg1989;76:535–40. Kampschoer GH, Fujii A, Masuda Y. Gastric cancer detected by mass survey. Comparison between mass survey and outpatient detection. Scand J Gastroenterol1989;24:813–17. Hisamichi S. Screening for gastric cancer. World J Surg1989;13:31–7. Hundahl SA, Stemmermann GN, Oishi A. Racial factors cannot explain superior Japanese outcomes in stomach cancer. Arch Surg1996;131:170–5. Baba H, Maehara Y, Takeuchi H, et al. Effect of lymph node dissection on the prognosis in patients with node-negative early gastric cancer. Surgery1995;177:165–9. Sue-Ling HM, Martin I, Griffith J, et al. Early gastric cancer: 46 cases treated in one surgical department. Gut992;33:1318–22. Hallissey MT, Allum WH, Jewkes AJ, et al. Early detection of gastric cancer. BMJ1990;301:513–15. Correa P. Human gastric carcinogenesis: a multistep and multifactorial process—First American Cancer Society Award Lecture on Cancer Epidemiology and Prevention. Cancer Res1992;52:6735–40. Lansdown M, Quirke P, Dixon MF, et al. High grade dysplasia of the gastric mucosa: a marker for gastric carcinoma. Gut1990;31:977–83. Kokkola A, Haapiainen R, Laxen F, et al. Risk of gastric carcinoma in patients with mucosal dysplasia associated with atrophic gastritis: a follow up study. J Clin Pathol1996;49:979–84. Villako K, Kekki M, Maaroos HI, et al. Chronic gastritis: progression of inflammation and atrophy in a six-year endoscopic follow-up of a random sample of 142 Estonian urban subjects. Scand J Gastroenterol Suppl1991;186:135–41. Wu MS, Shun CT, Lee WC, et al. Gastric cancer risk in relation to Helicobacter pylori infection and subtypes of intestinal metaplasia. Br J Cancer1998;78:125–8. Filipe MI, Munoz N, Matko I, et al. Intestinal metaplasia types and the risk of gastric cancer: a cohort study in Slovenia. Int J Cancer1994;57:324–9. Rokkas T, Filipe MI, Sladen GE. Detection of an increased incidence of early gastric cancer in patients with intestinal metaplasia type III who are closely followed up. Gut1991;32:1110–13. Fielding JW, Roginski C, Ellis DJ, et al. Clinicopathological staging of gastric cancer. Br J Surg1984;71:677–80. Rugge M, Farinati F, Baffa R, et al. Gastric epithelial dysplasia in the natural history of gastric cancer: a multicenter prospective follow-up study. Interdisciplinary Group on Gastric Epithelial Dysplasia. Gastroenterology1994;107:1288–96.